Breaking the generational gap by providing iPods to listen to their favorite music is the most ideal way to ensure the therapy’s effectiveness. Living Care Lifestyles, the leader and simply the best in senior lifestyle communities, partnered with the Snohomish County Music Project(SCMP), to conduct a pilot study at Quail Park of Lynnwood, to assess the effectiveness of music with seniors living with Alzheimer’s and late stages of dementia. 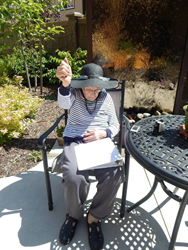 Due to the findings and positive experiences by all the participants of the pilot study, music therapy sessions continue to at Quail Park of Lynnwood. If you would like to schedule time to shoot video or photos of the music therapy sessions, please contact Tod Steward at tods(AT)livingcarelifestyles.com or call 206-441-1770. Quail Park of Lynnwood(independent, assisted living, memory care) is the premier senior lifestyle community for Snohomish County – offering only the finest in Retirement Living. Our philosophy is driven by your every desire... with limitless options and amenities that craft the perfect blend of tranquility and life enhancement. Just five minutes from the center of Lynnwood's upscale shopping and dining options and nestled on a peaceful evergreen hilltop, follow a winding nature drive and enter a new sanctuary and home. From the ideal location, Bailey’s Pub, pool and fitness center and beautiful interior to the Signature Anytime Dining Experience™ and life enhancing activities, every detail has been thoughtfully planned as "Simply the Best in Senior Living" in the greater Lynnwood area. Quail Park of Lynnwood is one of several exclusive communities owned and operated by Living Care Lifestyles based in Seattle, and is part of the family of Living Care lifestyle communities. Living Care Lifestyles, founded in 2001, is the leader and simply the best in senior lifestyles communities. The organization has communities located in California, Hawaii, Oregon, Texas and Washington. Lifestyle options include Dining, Independent Living, Assisted Living, Enhanced Assisted Living and Memory Care which includes the Tribute Program™. The unique program focuses on the needs of persons living with Alzheimer’s and dementia by paying tribute to each individual’s previous accomplishments while focusing on the persons remaining strengths and present relationships. Living Care Lifestyles is committed to offering the best in senior living care. The Snohomish County Music Project(SCMP) has been providing music services to the Everett community since 1935. In 2011 the Board of Directors of the Everett Symphony undertook a new mission, “to use the power of music to inspire people to do good things for their communities and for themselves”, and reorganized as the Snohomish County Music Project (Music Project). From its origin as the Everett Symphony, the Music Project has transformed into a human services organization that is bringing the power of music therapy to healthcare in Snohomish County by using music as a tool to address clinical, therapeutic goals. The SCMP is also the proud manager of the Northwest Music Hall, providing a vibrant performing arts and event space in support of community philanthropy and artistic inspiration.